Organic overload to a digester generates more VFA than the methane producing bacteria can consume. Depending on the composition of the feed, shock loading or overloading can lead to higher rates of VFA and digester gas production and cause foaming problems (Massart et al, 2006). This can also happen if there is no blending tank or a blending tank with insufficient mixing for the various types of feed, such as sludge, FOG and food wastes before digester. A sudden change in feed composition or feeding mix can also upset the operational condition. Inadequate mixing, excessive mixing or sudden power outage or mixing failure can contribute to this condition. This can result from the inability to maintain a stable temperature inside the digester causing temperature and density gradients resulting foaming problem. Higher biological sludge content inside the digester introduce higher amount of foam causing microorganism (Nocardia, Microthrix parvicella etc.) to the digester and increase the probability of foaming. Daily variations in volatile solids loading (organic load) to the digesters should be limited to 5 -10 percent. Better performance can obtained from feeding digester as continuously as possible, especially with FOG, food and high-strength organic wastes. Digester over-mixing, under mixing or improper mixing is a wide-spread concern and can contributes to foam production. Co-digestion with high strength waste can further add to this problem. That is why digester mixing system should be selected carefully considering the optimum mixing requirements as well as mixer performance. Digester should be design with additional head space and overflow capacity keeping the occasional foaming in mind. 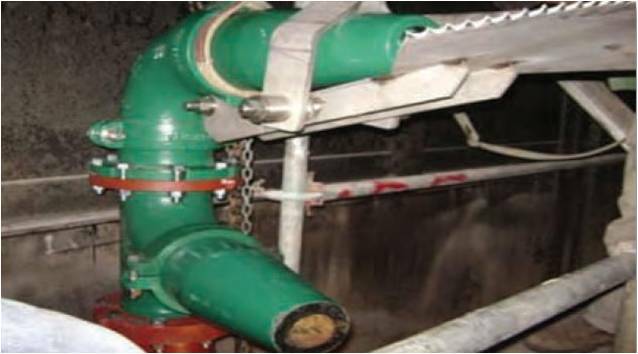 Once foaming incident occurs it can be controlled by physicallly breaking up the foam using sprays or adding defoamants or foam suppressant chemicals in the feed.